Few days ago, the Muro Team celebrated my birthday for me. From the left: Hirofumi, Hide, Mune, Tsutomu, Shun, Masaki, Suda, Totsuka, Katsuji, Yagira and Kento. Photo by Toma. Ryohei went back first, and after this, MJ joined in too. Isn’t the lead guy out of focus here? The one who took this shot! and okada masaki’s there too <3 gotta luv the gang! 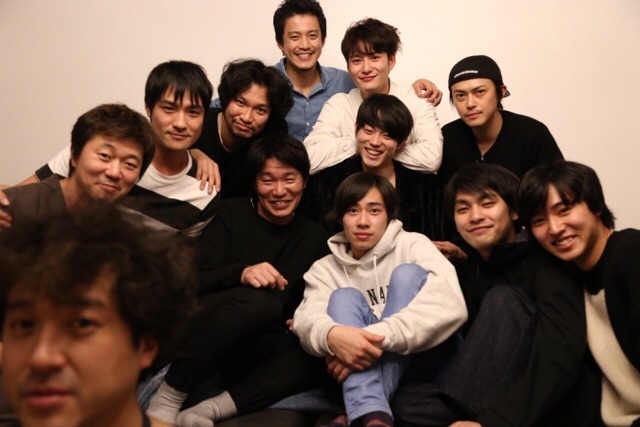 yeah, oguri shun, yagira yuya, toma & matsujun (even if they can’t appear in the photo), that ‘tako’ from jimi ni sugoi, and ‘nendou’ too haha~ muro tsuyoshi is cool!